The Proclear 1 day 90 pack is a popular brand of daily disposable lenses. The lenses are manufactured by CooperVision - one of the largest makers of contact lenses - and reflect the company's commitment and desire to create comfortable, high quality ocular solutions. Proclear lenses are one of the few lenses specifically designed to complement dry eyes. The Proclear 1 day 90 pack can be ordered online here and is available with prescription. Why Choose Proclear 1 Day 90 Pack? Unique Hydrophilic Material: The moisture retaining material used in making Proclear lenses is designed to ensure that even dry eyes remain comfortable with long hours of wear. People who typically experience discomfort or irritation caused by dryness after wearing contact lenses for a few hours, will appreciate the FDA approved performance of Proclear lenses. Safe Option: For people who are prone to ocular allergies, Proclear lenses offer a safer alternative. The daily replacement option available with the Proclear 1 day 90 pack means that wearers do not have to worry about battling protein deposits or cumulated dirt. Wearers also do not need to worry about using lens care liquids containing ingredients that they may be allergic to. PC Hydration Technology. CooperVision's PC Hydration technology enhances the performance of Proclear lenses by ingraining synthesised molecules - typically found in cell membranes - into the lenses. These molecules increases the lens' ability to retain moisture even with constant blinking, ensuring that they remain comfortable and moist for many long hours. Convenient: No need for bulky cleaning solutions. Proclear 1 Day lenses are ready to use when needed. They can be carried during trips and are suitable for people with active lifestyles. The Proclear lenses can be used during situations that require good peripheral vision such as driving or playing sports. High Oxygen Permeability: The human eye relies on oxygen to stay healthy. The Proclear 1 day lens is designed out of a permeable material that delivers over 70% of the available oxygen to the eyes. The steady provision of oxygen reduces the risk of irritants and protein deposits. It also contributes to the long term health of the eye. The Proclear 1 day 90 pack is ideal for adults suffering from poor vision. It can be used as a convenient alternative to glasses or extended wear solutions. It is also an ideal option for frequent travelers who live active lifestyles. 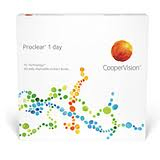 The Proclear 1 day pack can be used for vision correction. To get the best results though, users will need to visit an optometrist for an ocular examination. 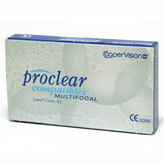 Like most lens products, Proclear 1 day 90 packs can be found offered online at different prices. Contact Lenses Online offers the cheapest prices on contact lenses. As well as offering discounted prices, each sale on Contact Lenses Online is accompanied with a receipt which users can use in securing rebates from over 30 different Australian private health funds. Abnormal growth in the eyelid, cornea or conjunctiva which may be worsened by the constant use of contact lenses. Known history of allergic reactions to the ingredients used in manufacturing Proclear lenses. Eye infection caused by bacterial, fungal or viral pathogens. Continuing with the standards set by the company, the Proclear 1 day 90 pack is an attractive option for people who prefer the convenience of daily disposable solutions. It offers a fresh, no hassle start to each day and is used by thousands of people and enjoys many positive reviews on its performance. The Proclear 1 day 90 pack can be used regularly or infrequently as the need arises. It is available for order and delivery to all parts of Australia. Proclear Compatibles. The original and still one of the best monthly disposable contact lenses on the market. Proclear Toric. 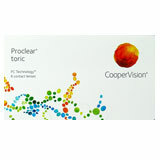 If you have astigmatism and would like clearer vision then the monthly disposable, toric version if what you will need. Proclear Multifocal. Just because you need bifocal or multifocal glasses doesn’t mean you have to wear them. Proclear multifocal contact lenses provide clear vision at both distance and near with the added benefit of PC Technology to ensure unparalleled comfort throughout the day. Proclear Multifocal EP. If you are only just starting to need reading glasses then this may be the contact lens for you. Early presbyopes adapt easily to this "beginner" multifocal lens.